Source: Doody’s Book Reviews™ Doody Enterprises, Inc.
represent a major risk factor for cardiovascular disease. It will be of interest to students, physicians in training, primary care physicians, and specialist clinicians. and potential new indications of statins, novel lipid modifying agents. Dyslipidemias are a major risk factor for cardiovascular disease and it is essential to clearly understand the pathogenesis of lipid disorders, atherogenesis and related cardiovascular morbidity, and the appropriate treatment measures. The authors have done an excellent job reviewing these topics. This comprehensive, up-to-date book is a great addition to current medical literature. Atherosclerotic vascular disease is by far the most common cause of cardiovascular disease, and therefore among the leading causes of death worldwide. It was in 1910 that the Nobel Prize-winning organic chemist, Professor Adolf Windaus, first identified cholesterol in atherosclerotic plaques in human aortas. This was soon followed by the famous experiments of Anichkov and Chalatow, two young Russian physicians who fed rabbits large quantities of cholesterol and showed that they developed lipid-laden lesions in the aorta. A century has passed since then: numerous observational studies, registries and clinical trials have documented the importance of circulating cholesterol in the development of atherosclerotic lesions of the arterial bed, leading to ischemic heart disease, cerebrovascular disease, peripheral arterial disease, renovascular and aortic disease. Although there are a number of other important atherosclerotic risk factors (such as diabetes mellitus, hypertension, chronic kidney disease, cigarette smoking and abnormally low levels of circulating high-density cholesterol), the elevation of plasma low-density lipoprotein cholesterol concentration is a necessary – albeit not always sufficient – condition for atherogenesis. Therefore, it is imperative that physicians possess a clear understanding of the genesis of dyslipidemias, how the latter lead to atherothrombosis and finally the measures that are now available to treat and/or prevent atherothrombosis. 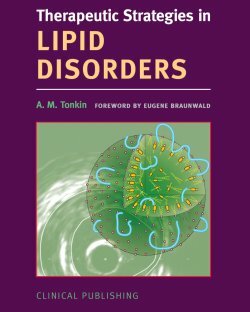 Andrew Tonkin, a world-renowned epidemiologist and clinical trialist in the field of lipid disorders, has gathered an outstanding group of authors to produce 'Therapeutic Strategies in Lipid Disorders'. Although the central focus of this book is on the critical analyses of interventions designed to optimize plasma lipid concentrations, it also pays appropriate attention to diabetes, hypertension and chronic kidney disease, all of which interact with lipids in atherogenesis. The book ends with a truly excellent ‘wrap up’ chapter by the editor on the translation of scientific evidence into improved clinical outcomes. This is a very important, well-written book on a crucial subject. It will be useful to and appreciated by scholarly cardiologists, lipidologists, epidemiologists and clinical trialists, especially those who are joining forces to control the pandemic of atherosclerosis.